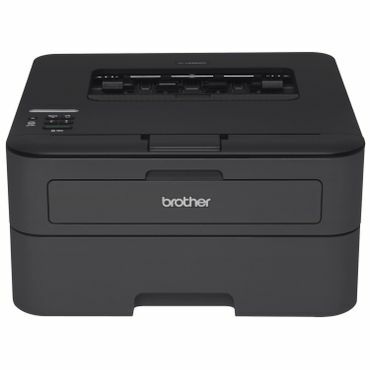 Whether you want a black and white laser printer for your home, home office or large enterprise, Brother is a clear top choice. These printers are cheap to run, produce great text and tout award-winning reliability. If your budget is tight, we also found a Canon monochrome laser printer worth considering. Specs that Matter Pages per minute – 48 Paper capacity -- 520-sheet input; 50-sheet multipurpose Dimensions (w,d,h) – 15.7" x 15.6" x 11.3"
The Brother HL-L6300DW is an outstanding choice for busy offices, experts say. It's value priced for a printer in this performance class and relatively cheap to run. Other pluses include quick printing speed (48 text-only pages per minute), a high-capacity paper drawer (520 sheets) and automatic duplexer. Full connectivity options allow you to share the printer wired or wirelessly; print directly from a smartphone, tablet, PC or other device; or print from the cloud. Specs that Matter Pages per minute – 27 Paper capacity -- 250-sheet input; single-sheet manual feed Dimensions (w,d,h) – 14" x 14.2" x 7.2"
Experts and owners point to the Brother HL-L2340DW as a top value among black-and-white laser printers. Don't let the small price tag fool you: This is one capable printer. It's small, quick (27 text pages per minute), and cheap to run. Wireless networking is easy, with Wi-Fi Direct built in, and it has a duplexer. Print looks crisp, even at 2 point fonts. The Brother brand boasts award-winning reliability, too. For a busy office setting, you needed a business-class laser printer to handle the workload. Costing $200 or more, these printers are fast, (40 or more text pages per minute), and have the processing power and memory to handle big and/or complex print jobs. Expect high-capacity paper drawers that can hold whole reams of paper (and add-on drawers to hold thousands of sheets). Expect wired and wireless networking capability as well so that a single printer can be shared among users. For home use, or for a home office, a less robust, but also less expensive laser printer will do just fine. These typically cost between $60 and $200. The cheapest have only a USB connection for one computer. Step-up models have Ethernet and Wi-Fi connections, so several users can share the printer, print wirelessly and print directly from a smartphone or tablet. These printers hold only enough paper for one or a few people (usually 150 to 250 sheets). The fastest can crank out about 32 text pages per minute. If you mostly print text -- or don't need color printing -- consider a black-and-white laser printer. Busy offices have relied on monochrome laser printers for decades because they're faster, cheaper to run and more dependable than any other type of printer. They print sharper text too. The drawback? Grainy graphics and photos. You might feel OK using them for PowerPoint handouts and the like (if you're not too picky), but that's it. There are other options, too, all with their own pluses and minuses. Color laser printers print beautiful color graphics, but they cost more than a monochrome laser printer. Inkjet printers deliver professional-looking photo prints, but they're far slower and costlier to run than laser printers, the ink often clogs up or runs out, and they break down more. All-in-one printers can be convenient as they also copy, scan, and often fax. They can also be cost effective if you also need a device that can do all of that. However, if you don't need that functionality, for the same price, and often less, you can get a standalone laser printer that prints faster and sharper, with bigger paper trays, all while gobbling less space on your desk. Still, if one of these other types of printers is a better fit for your needs, or budget, they are all covered in their own reports. To find the best laser printers, we sift through expert tests and owner reviews (some popular models have amassed thousands of these). Like the best sources -- PCMag.com, ComputerShopper.com, ConsumerReports.org and others -- we consider all aspects of the printer before picking best choices: print quality, speed, paper capacity, features, ease-of-use, price, toner cost and durability. Big reader surveys by PCMag.com, together with brutally honest owner feedback at Amazon.com, Staples.com and other retail websites, help us separate the reliable laser printer brands from those that are morerepair-prone. Quite simply, Brother laser printers are the most reliable you can buy, reviews say. They're the easiest to set up. They break down the least. And owners recommend them more than any other brand, at every retail website we checked and in PCMag.com's annual Readers' Choice survey. "Once again, as it has done every year since 2010, Brother wins the PCMag Readers' Choice Award," PCMag.com announced in July 2017. "It's had a good decade." Brother sells everything from small personal laser printers to big corporate behemoths. But for many heavy-duty office users -- those who print 7,500 pages per month on average (about 250 per day) -- the Brother HL-L6300DW (Est. $350) is the perfect choice. It's the new Editors' Choice in its class at PCMag.com, and it also earns Recommended status at ConsumerReports.org. This is the new version of the previous Best Reviewed pick, the Brother HL-L6200DW, and it impresses experts just as much. It's basically the same outstanding printer, but with several new goodies added. Like its predecessor, the HL-L6300DW is super-speedy -- nearly 51 text pages per minute (ppm) in PCMag.com's test, better even than Brother's rated speed of 48 ppm. Throw a more complex document at it (with graphics, spreadsheets, PDFs and PowerPoint slides), and it zooms way ahead of the old model, cranking out more than 23 ppm. Text is "terrific-looking," PCMag.com's William Harrel says. Graphics and photos aren't any mono laser printers' strong suit, but the HL-L6300DW's are "acceptable" -- fine for PowerPoint handouts and newsletters. Cost per page is remarkably low -- "one of the lowest we've seen from a laser printer in this class," Harrel says. You'll spend just 1.3 cents per page. Bonus: The HL-L6300DW comes with a high-yield 8,000-page toner cartridge right in the box, unlike some other printers that come with dinky "starter" cartridges. Paper trays are robust: 520 sheets in the drawer, with a 50-sheet multipurpose tray and up to two optional drawers for a maximum of 1,610 sheets. Standard features include a duplexer and full connectivity options (USB, Ethernet, Wi-Fi, Wi-Fi Direct, and the ability to print directly from mobile devices or the cloud). So what's new on the HL-L6300DW, compared with the old model? Well, for starters, it's heavier-duty. The old version could handle only 5,000 pages in a normal month (or 100,000 pages max), while the new model can comfortably churn out 7,500 pages per month (125,000 pages max). The output tray holds more pages (250 sheets versus 150). The included high-yield toner cartridge is a new addition, as is the color touch screen (the old model had a one-line LCD). The new model also adds Near Field Communication (NFC). This makes it easier to pair your mobile device for printing (just tap to pair), and it also allows for some sophisticated security features. For example, you can restrict printing only to office personnel with an NFC card. "There's also a USB 2.0 port on the back for connecting an external IC card reader," Harrel says. Like the NFC card reader, this authenticates users for releasing secure print jobs. While there isn't a ton of user feedback yet, most of what's available looks very good. As an example, the Brother HL-L6300DW earns a score of 4.8 out of 5 stars at Amazon.com, based on nearly 20 reviews. It also earns 4.7 out of 5 stars at OfficeDepot.com, but with fewer than 10 reviews posted at the time this was written. Reviewers say that there really aren't many downsides, other than the "so-so graphics and photo quality," Harrel writes. The HL-L6300DW measures about 16 inches square and 11 inches tall. That's pretty compact for a printer this capable, although still a little big to sit on your desk. It carries a one-year warranty with free phone support for the life of the printer. 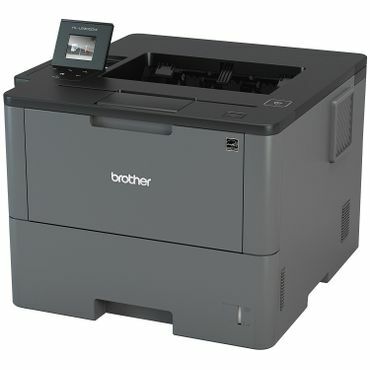 If you print less than 100 pages per day, $100 will buy you a great laser printer: the Brother HL-L2340DW (Est. $100). It's "wicked fast for home use standards," says Liam McCabe at TheWirecutter.com. After 90 hours researching more than 100 cheap printers and testing four, McCabe names it the best laser printers for most people. It's also named a Best Buy by ConsumerReports.org. User feedback is plentiful and fairly solid, including a 4 star score at Amazon.com, based on more than 3,800 reviews. Reliability is excellent. It can print every day, or it can sit for weeks without printing at all -- unlike inkjet printers, which clog up and die if they don't print regularly. It doesn't paper jam ("we couldn’t jam it even when we tried," McCabe says). And Brother printers rarely break down: They've won PCMag.com's Reader's Choice award eight years running for being so dependable. Printing is cheap (2.3 cents per page, including wear on the drum in TheWirecutter.com's testing), fast for this class (27 pages per minute) and sharp. PCMag.com's M. David Stone quibbles with the print quality, but says it's "good enough for most business use." Extreme close-up photos at TheWirecutter.com show that text is "plenty crisp and sharp" at a minuscule 2-point font size -- which is probably more than most users will ever demand, anyway. The printer has a 250-sheet main paper drawer, single-sheet manual feed and 100-sheet output capacity. It can print up to 10,000 pages in a month, although Brother recommends sticking to 2,000 pages or except for rare occasions. Connectivity options are USB 2.0 and Wi-Fi, but there's no Ethernet port. Brother sells few other printers in this series. The Brother HL-L2360DW (Est. $100) sells for a few dollars more than the Brother HL-L2340DW (or, with careful shopping, can sometimes be found at around the same street price), but has a couple of pluses -- namely very slightly faster print speed (32 ppm) and an Ethernet port. Reviewers that have looked at both printers like them more or less equally -- it's a runner up choice at TheWirecutter.com, and also a Best Buy at ConsumerReports.org. User feedback is again plentiful and very solid; It scores a 4.6 star rating at BestBuy.com, for example, amassing nearly 1,575 reviews there. The series also includes the Brother HL-L2300D (Est. $95) and Brother HL-L2320D (Est. $100). The core performance and print quality will again be largely the same, but these models have less connectivity (they are USB 2.0 only, with no wireless or Ethernet) and lack an LCD screen (the more upscale Brother printers have a 1-line LCD readout, while these two use LED indicators instead). They also have only one-fourth the memory (8 MB vs. 32 MB), so they won't handle big print jobs as smoothly. While the MSRPs for these printers are lower, street prices are often similar to the more full-featured models, so unless the differences don't matter to you, and unless you can find Brother's more basic models on sale at an attractive price, we recommend going for the HL-L2340DW (or the HL-L2360DW) instead. PCMag.com, ComputerShopper.com and ConsumerReports.org regularly test laser printers, making up-to-date expert recommendations of the best models. TheWirecutter.com also conducts a well-designed laser printer shootout. User reviews at retail websites (Amazon.com, BestBuy.com, Staples.com and OfficeDepot.com) are crucial for showing how the printers perform in real life, as is PCMag.com's annual Readers' Choice survey. A monthly duty cycle that fits your needs.